If Greek yoghurt is not available you can make your own Greek style from plain yoghurt by suspending a sieve lined with cheesecloth over a bowl, adding the yoghurt and allowing it to drain for 2-3 hours, or longer if thicker yoghurt is preferred, in a refrigerator. A paper coffee filter can be used as an alternative to a cheesecloth, following the above method. Tzatzike makes a great accompaniment to lamb steaks/chops or can be used as part of a summer mezze. 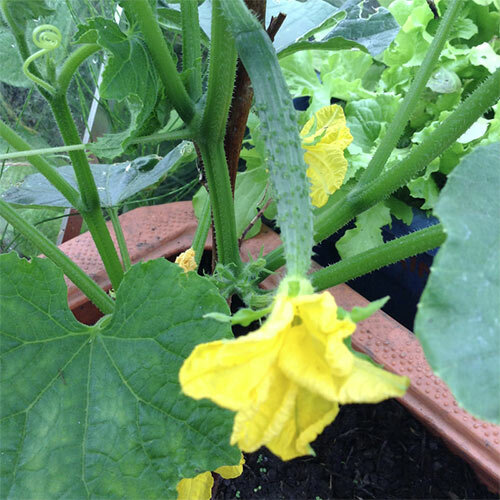 Cucumber plant in Mette's Warriston greenhouse.